Natalie Watson PhotographyThe music-filled destination celebration was personalized with a pathway of rose petals in the bride’s favorite color, a dance up the aisle to Pharrell Williams’ “Happy,” and a surprise ukulele performance by the groom of The Carpenters’ “Top of the World,” not to mention a special hula performance done as husband and wife. See their beautiful ceremony captured byPerryfield Films. They talked some more—this time, in plain old English—and after two years of dating, a month of which was spent on a bus as Matthew toured for his new album, he tearfully proposed in Maui with a sapphire-and-diamond ring. With the islands being such a big part of their story already, the pair began planning an intimate three-day modern luau that included a welcome dinner, a sunset cruise, and on the last day, their nuptials on a private estate. After Matthew proposed in Maui, the couple chose the island to be the backdrop to their chic Hawaiian celebration. “We wanted a slower pace, and Maui is a great mix of touristy and natural beauty,” Matthew says. Each of Renee’s bridesmaids held a grouping of lisianthus, irises, blue curiosa roses, ocean song roses, maidenhair fern, and scabiosa pods. The colors reflected the bride’s favorite shade, lavender. A blown conch shell marked the official beginning of the ceremony. During the emotional ceremony, Matthew pulled out a handkerchief he had embroidered with Renee’s married initials, “RMM,” to wipe her tears. Renee’s niece tossed rose petals as she walked down the aisle in a dress from FlowerGirlsCouture. At each reception table, wooden bowls held arrangements of purple hydrangea, scabiosa pods, irises, lisianthus, ranunculus, campanula, clematis, allium, and roses. All of the wedding’s festivities—from Thursday’s welcome dinner to Saturday’s reception—took place at a private estate right on the beach in Kihei. 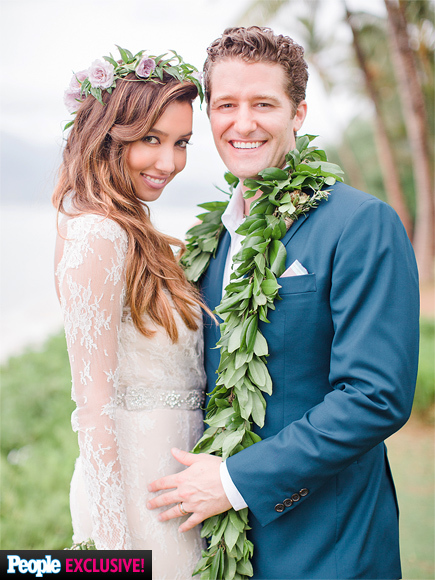 Matthew Morrison Marries Renee Puente! HQ pictures in the galleryIt sure was one gleeful moment when the actor popped the question to his longtime girlfriend last summer, but Matthew Morrison and Renee Puente must be grinning ear to ear after tying the knot. The two were married Saturday evening in an intimate celebration in front of 50 family and friends on a private estate in Kihei on the island of Maui, Hawaii, the actor’s rep confirms exclusively to PEOPLE. Morrison wore a custom Brooks Brothers tuxedo for the occasion, while the bride wore a one-of-a-kind Gustavo gown with shoes specially designed by Emmy London. Of course a Glee wedding would be incomplete without musical performances. Pianist Chad Whidden played for the crowd and soloist Kiley Dean sang “Feels Like Home” as Puente walked down the aisle. Kevin Covey Wedding and Events planned the affair, which featured food by Bev Gannon’s Celebrations Catering – including a special dessert station made up of Morrison and Puente’s favorite family recipes – and floral and décor by Inviting Occasion. Photography was provided by Natalie Watson Photography and Watson Studios, and the videographer was Perryfield Films. Best wishes to the newlyweds from the webmaster and everyone of the site visitors! !